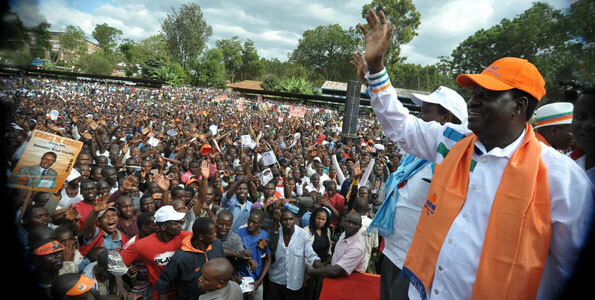 ← Raila and Cord On The Campaign Trail; The Momentum Is Building! In Gusii Is Fully Corded I said “Having accompanied the Cord team for rallies and having witnessed the historic crowd in Kisii Stadium with my own eyes, there is not a question Gusii is fully Corded. This was not the case just a few weeks ago. Not surprisingly, and as they always do–copying, imitating or otherwise trying to replicate Raila/Cord successes, Uhuru and Co went back to their drawing boards trying to figure what they can do to not necessarily match for they can’t, but slow down the momentum Raila and Cord have picked in the most reliably independent of all communities in the country. Following the script of this strategy, the Uhuru schemers went into overdrive with their point-man in Gusii, the never has been so-called “Professor” Ongeri to try and make some come back there. The “professor” who really gives professors a bad name, and his minions concocted a plan that they also initially tried to recruit Omogaka Simeon Nyachae to bring Uhuru and Co back to Gusii in what they hoped will be a huge rally to try and undo what Raila and Cord have gainfully done in the recent past. Nyachae, who most of my readers know to be someone I consider a friend and political mentor, initially declined to work with the Ongeri clowns and this only in the last week or so. Today, I am told Uhuru camped out at a Kisii hotel where he was doing what he does best and the only thing he knows in politics, and that’s dishing out money in the hopes of buying support. Reliable sources tell me a plan was concocted and unfortunately involving my friend Nyachae in which people were being paid from Kshs100 to 500 to attend an impromptu rally at Kisii Stadium. When this shameless facilitation was complete, Uhuru with Nyachae in tow went to the “rally” and what happened from there is something I would not wish to blog about but do out of necessity because the truth must be known no matter whether it’s someone like Nyachae I highly respect or an Ongeri who I really have never had any good reason to. Nyachae took to the podium and thought it fit to declare his support for Uhuru. First, Nyachae claims as compared to Raila, the Uhuru team has plenty of money–which is really nothing revealing in by itself other than it was Nyachae himself saying this–a very wealthy person in his own right you would think money or the consideration of it would not be a factor in who he supports. Second, and this is the reason I would not have any issue with any time because I understand its premise and underlying logic, Nyachae says he supports Uhuru because his father was his friend and was good to him (Nyachae) when he was a civil servant. Third reason Nyachae gave but not in a direct way–and this is the shocker to me, is publicly dissing his own son, Charles, CIC Chairman, for supporting Raila/Cord, which is another way of saying Nyachae would not and cannot support Raila. I understand where my good friend Nyachae’s reluctance to support Raila comes from and I have previously blogged about it; in a nutshell, it’s largely because Raila said Kibaki tosha in 2002 when Nyachae and those of us with him had hoped Raila would have said Nyachae tosha. Raila’s decision was a stinger and I can speak to that because I know we all knew the moment he said Kibaki tosha, Nyachae’s presidential bid was finished and over with without any much further effort on anyone’s part, including Nyachae in what he did or could not do afterwards. However, after all these years, one would think Mzee Nyachae would let that go. He has not and acting on the same emotion, my good friend has probably committed the most embarrassing thing he ever could notwithstanding the many decades he has said and done great things as a civil servant, businessman and politician. It is my hope and wish my good friend Nyachae can have a moment of reflection and reverse what he has done for he will be harshly charged in history in these graceful sun-setting days of his illustrious career. In the least, Nyachae has to and must retract the public humiliation of his son Charles, whom he also challenged to sue Kibaki over the non-gazettement of the land reform commission. As a father and senior elder, he owes his son that much. I doubt my good friend Nyachae can come up with any reasons that would persuade the more than 70% of Abagusii who will vote for Raila and Cord candidates come March 4, 2013, but he can try. The least he can do, is erase or at least try to erase the embarrassment and major stain to his legacy that would remain were the not to retract or modify the reasons he gave for the endorsement and even above all, his dissing of his own son, which I would have to believe and must believe was not done with much reflection. Were Nyachae to reflect on the latter, I have no doubt he would agree with what I have said at least with respect to that blunder. It’s also the right thing to do under our community’s traditions and culture, which he knows very well and is a major part of. His own father, Senior Chief Nyandusi will demand nothing less. As for Raila and Cord, Gusii is fully corded no matter what Nyachae does the only counsel I’ll give him as both a friend and political mentor is, people do make mistakes that’s why pencils have erasers; he has made one, but it’s not too late to erase the mistake.